A total of 9 EV charging stations: 8 Level 2 chargers and one Level 3 charger were installed by the Electric Vehicle Institute (EVI). Charging stations are located throughout the 85 acre Camden Yards campus. 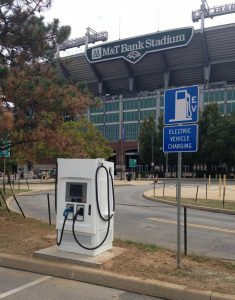 This program was made possible by a grant from Maryland Energy Administration’s Electric Vehicle Supply Equipment Rebate (EVSE) Program and was completed in partnership with the Maryland Stadium Authority (MSA). Additionally, MEA offers funding for charging stations under the Alternative Fuel Infrastructure Program (AFIP), a competitive technology-neutral grant program also provides funding assistance for CNG, propane, ethanol and hydrogen fueling stations. AFIP provides funding for 50% of the total turnkey DC fast charger cost up to $45,000 per station. The AFIP provided funding assistance for the DC Fast Charger at M&T Bank Stadium. EVI, a Baltimore based company, has installed over 200 Level 2/3 EVSE stations throughout the City since 2010. 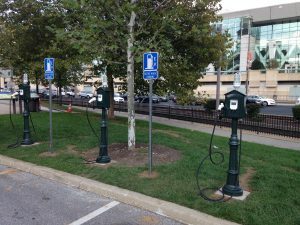 “This EVSE installation not only provides state-of-the-art, Level 3 Charging Stations, but unique Level 2 Charging Stations, reminiscent of Urban Call Boxes, in Camden green,” said Matthew Wade, CEO at EVI. “These charging stations utilize repurposed historic infrastructure, which maintains the sensibility and vision of the iconic Camden Yard facility,” continued Wade. Camden Yards is a multimodal transportation hub, the nexus of rail, bus and interstate highway routes at the gateway to Baltimore. The 5,000+ parking spaces serve downtown and hospital employees, convention center visitors and commuters. 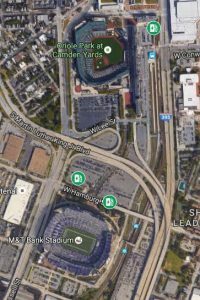 In addition to the charging stations, Camden Yards will feature another green transportation option when it joins the new Baltimore Bike Share program (https://www.bmorebikeshare.com/) in the spring.